My wife and I had the joy of teaching Children’s Church on Sunday, and I loved the opening illustration. As the children came into the room they took turns writing what they do to get ready for Christmas on the whiteboard. As could be expected 10 days before Christmas, most of it had to do with presents. 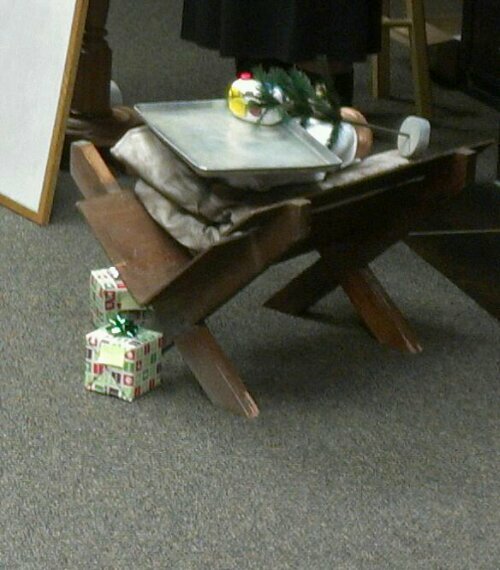 Then Melanie read a list of some of the things we often do to prepare for Christmas and a prop was placed into a manger on top of a doll for each activity. There was a cookie sheet, a little Christmas tree, a camera to represent the family photo, stationery, and of course several presents. The point was not that doing activities to celebrate Christmas is bad, but rather that we can get so busy getting ready to celebrate Jesus’ birthday that we forget about Jesus. He can get covered up by all of the details or traditions and be completely missed. Isn’t this what the chief priests and scribes did in Matthew chapter 2? They were so concerned with their traditions that even though they knew a lot about Christ’s birth, they didn’t go to see Him or worship Him. All of those things in the manger in that Children’s Church room should have been outside the manger. They should have pointed to Jesus rather than take His place! Such a great illustration for the children! Thanks so much for teaching them and all the other duties you have at IBC. Next PostNext A Worthy Resolution: Living for the Fame of Jesus Christ in 2014!